I feel this empties is about half finished up and half declutter, which seems to be a bit of a trend with my empties posts. I feel like by the end of the month, I always look for anything that’s maybe been hanging around too long and pop it in with the things I’m already moving out of my collection. I finished up two of the Vitamasque sheet masks that I purchased during the Priceline 40% off Cosmetics Sale. I really enjoyed them, they were both really moisturising and out of the two that I used, I’d probably say the Manuka Honey one was my favourite. I’d definitely repurchase them again! I finished up another Australis Fresh and Flawless powder. It’s not an empties if I haven’t finished one, am I right? I tried a sample of the Benefit Boiing Concealer in shade 1, and honestly, if they made a shade light enough for my skin, I’d probably purchase it. It was light and moussey to apply and it had great coverage but it looked orange under my eyes so I had to wear two concealers that day. If you’ve got darker skin, I think they might have a better colour selection for you! I finally finished up the Milani eye primer. I don’t know that this did a whole lot. I sometimes think eye primers are a bit of a gimmick but I enjoyed it while I had it. I’m now completely transitioning to my MAC Paint Pots. Finished up a Covergirl Supersizer mascara. I always love this mascara when I am first using it and then when it’s really getting to the end of it’s life, I start hating it and thinking I should change mascaras, which is so odd but I guess maybe it has a shorter life than other mascaras because most other ones I own don’t start really underperforming until the last 5 uses, or so. And even then, it’s not horrendous. But I still like buying it. I have moved on to my last Supersizer mascara, and then I’ll try something else. I also finished up a LUSH Dream Cream. This was designed for eczema and dermatitis and I’m not certain that it completely helps my skin much at all. I’ve mentioned this before but I am not completely convinced by a lot of LUSH skincare. I love their bath accessories and things like that but their skincare always makes me wonder whether it’s worth it. Beyond the scrubs, I’m still not quite convinced. Lastly, I finished up my Davroe Hydrating Shampoo. I really enjoyed this and would definitely repurchase it! I adore Davroe hair care and I really felt spoiled while I was caring for my hair with Davroe again! 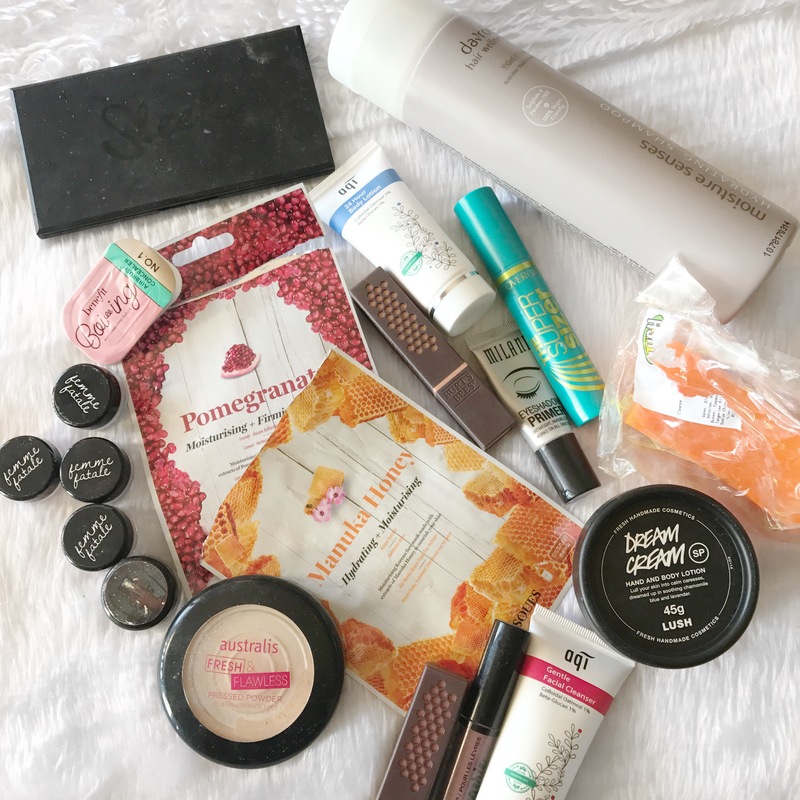 Now on to the products that I’m decluttering! Decluttering a few pigments from Shiro Cosmetics and Femme Fatale. Having owned the Femme Fatale pigments for a few months now, I’ve sort of figured out which ones I like more than others and I’ve decided to pass a few on. I took this photo and immediately removed them so I have no idea exactly the shades I’ve removed, I’m afraid. I know Star at Rest and Faerie Fire were two of the ones I removed and it’s mostly because they’re underwhelming on the eye, despite being beautiful when swatched. I just want to keep my collection manageable and only keep the best of the best so I had to let go of a few of these! Also decluttered my most coveted Sleek palette in Garden of Eden. I think that because I’d hyped up this palette so much, I had a lot of expectations about it. I’ve worn it multiple times and the shadows always fade to ugly grey shades on my eyelid. It’s so disappointing because the start off looking so beautiful and then by the end of the day they transform, a bit like myself as I take my makeup off at the end of the day. Hello, monstrosity. Lastly, I’ve decluttered my NYX Lip Lingerie in Embellishment, LUSH soap and AQI Skincare minis all because I either didn’t completely get along with them or just had other things I’d prefer to use over them. I don’t dislike any of them, they’re just not my favourites! I feel like I need to go the same with my FF pigments, I have so many and dont really use them! I agree with you on LUSH skin care, I adore their scrubs! I love MAC paint pots! They work so great for me as primers and are amazing for days when I want a light eyeshadow look!